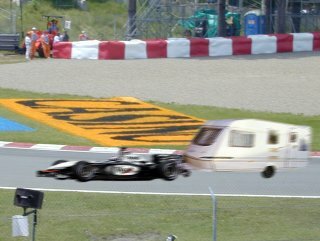 British driver David Coulthard has asked his team McLaren Mercedes if they should consider scrapping the new caravan attachment created for their 2004 Season car, the McLaren MP4/19. He has blamed the device for being responsible for most of the pace problems they have been suffering this season. Ferrari Boss, Jean Todt, has claimed he is very unimpressed with McLaren�s blatant disregard of the rules by introducing the caravan design, claiming the FIA regulations restrict Formula 1 cars to only 4 wheels. The McLaren design has 6 wheels in total � 7 if you count the little wheel at front.